Want to know what growth looks like? Want to know why what we're doing is important here? Today, one of our athletes spoke at a ceremony at Toyota's campus in town. When he got to the stage, his speech wasn't there and he had to wing it. He was amazing! He was confident, he smiled, he ad-libbed, and not a single one of us had dry eyes as we realized what was happening. I'm not sure how that would have gone a week ago, but today, he crushed it! All three of our athletes have grown in just the short time we've been together. Another of our athletes, Daniela, was break-dancing when a dance party broke out after a ceremony (that actually happens quite a lot). When her mom found out, she told us that Daniela NEVER dances, and that they don't think they're going to get the same kid back next week. I'm here to tell you, her parents are correct! All three of them are more outgoing and confident, and I can't believe I had the privilege of being here to see that transformation! My roommate Gumi, when talking about his son, said that as a parent of a Special Olympics athlete he knows first-hand that transformation. The first time his son left Iceland to compete was when he was 13. Gumi and his wife were stressed out, but their son came back having gone through the same maturation. In subsequent years of competition, they haven't worried about their son being gone. 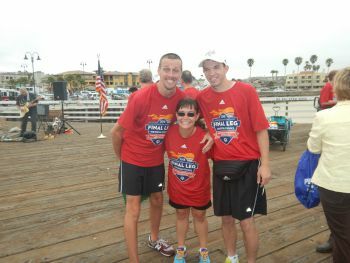 Special Olympics gave our three athletes, Gumi's son, and countless others a chance to STRETCH beyond what they maybe could have been had Special Olympics not been part of their lives. You might be getting tired of me beating this drum, but too bad, I'm going to do it again: You can help give a person with intellectual disabilities an opportunity to stretch. Support Special Olympics with your time, or money, or by turning on ESPN on Saturday night and over the course of the World Games and lend your support by giving ESPN a ratings boost. If we watch in sufficient enough numbers, they'll cover it again, and we'll be one step closer to a more inclusive society!